The Toronto Raptors finalized a deal to acquire centre Marc Gasol from the Memphis Grizzlies for centre Jonas Valanciunas, forward C.J. Miles, guard Delon Wright and a second-round pick in 2024. 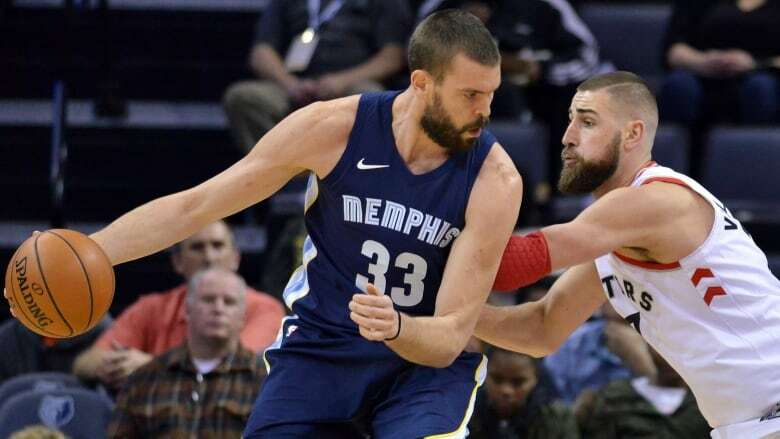 The Toronto Raptors have pulled off one of the league's biggest deals at the NBA trade deadline, acquiring Marc Gasol from the Memphis Grizzlies for Jonas Valanciunas, C.J. Miles and Delon Wright. The blockbuster deal, which was completed late Thursday evening, brings a player long coveted by Raptors president Masai Ujiri to Toronto. It's also a power move for a Toronto team looking to at least keep pace with Milwaukee and Philadelphia in the Eastern Conference. "[Gasol] is one of the best fives in the league for a long time now, perennial all-star, defensive player of the year," VanVleet said. "Just really excited to see how we can acclimate him to what we do and see how much he can give us a boost. Obviously we're very excited about that." The 76ers and Bucks had made major moves ahead of Thursday's 3 p.m. ET deadline, the Sixers landing Tobias Harris and Milwaukee acquiring Nikola Mirotic. As Thursday wore on, Raptors fans took to social media to implore Ujiri to make a major move. And he did. It's Ujiri's biggest trade-deadline deal since returning to the team in 2013. Gasol is a three-time all-star and the 2013 defensive player of the year. He's averaging 15.7 points, 8.6 rebounds, 1.2 blocks and 1.1 steals a game, and his 4.7 assists a night is second best in the league behind Jokic. The seven-foot-one Spaniard is a two-time Olympian, and will be reunited with Spanish coach and Raptors assistant Sergio Scariolo in Toronto. Gasol, who played 11 seasons in Memphis, is slated to make $24.1 million US this season and has a player option for $25.6 million next season. Last summer, Gasol volunteered as part of a Spanish rescue effort in the Mediterranean Sea, plucking people from the water who were fleeing Africa. A photo showed Gasol helping lift a woman onto a stretcher. He voiced his "Frustration, anger and helplessness" on Twitter, writing "It's unbelievable how so many vulnerable people are abandoned to their deaths at sea." In Valanciunas, the Raptors' lose of their most popular players. The 26-year-old, who was drafted by Toronto fifth overall in 2011, was finally cleared to play Thursday after missing 25 games with a dislocated left thumb. The team posted a photo of the big Lithuanian on social media with two words: "I'm back." Valanciunas told reporters in Atlanta on Thursday morning: "I am really excited. I was really looking forward to this day and there you go. If nothing crazy happens, I will be playing." Toronto guard Norman Powell said he will miss his departing teammates. "We were in the foxhole when we weren't getting minutes, talking about the process, and working to make an impact when we did get the time and growing together in the league, so it was definitely tough seeing guys like that go, but you just wish them the best," said Powell. "I'm sure they'll make the most of a new opportunity and chance to go out there and prove themselves with another team." The moves leave the Raptors with just 10 players under NBA contracts, and they must be at 14 within the next two weeks. They could convert one or both of their two-way contracts with Chris Boucher and Jordan Loyd to NBA contracts. Ujiri, meanwhile, made two moves just prior to the 2017 deadline, acquiring Serge Ibaka from the Orlando Magic and P.J. Tucker from the Phoenix Suns. That Raptors team was swept by Cleveland in the second round of the playoffs. A day after trading Gasol to Toronto, the owner of the Memphis Grizzlies says the franchise will retire the centre's No. 33 jersey some day in the future. Owner Robert Pera issued a statement Friday morning after the franchise confirmed the trade netting Memphis a trio of players and a second-round draft pick in the 2024 draft. Pera praised Gasol as a pillar of the Grizzlies for 11 seasons and part of the core that shaped the franchise's identity on and off the court. Pera thanked Gasol , saying they look forward to one day welcoming the centre back with his jersey hanging in the FedExForum rafters next to those of Zach Randolph and Tony Allen. It's been a wild week for Canadian NBA player Nik Stauskas, and it might not be over yet. A person familiar with the negotiations says Stauskas and Wade Baldwin have been traded from the Houston Rockets to the Indiana Pacers, the third time they were traded this week and second time Thursday. Reports say the Pacers plan to waive the players. Stauskas, from Mississauga, Ont., and Baldwin started the week with Portland, then were traded to Cleveland, then Houston and now Indiana. Stauskas has now been on the roster, however briefly, of seven NBA teams since being selected eighth overall by Sacramento at the 2014 NBA draft.